Since November 2014 Stentor has a state of the art production line in a brand new purposely build facility in Curcani, 50 km South of Bucharest, Romania. The location has direct access to the DN4 motorway to Bucharest. The building was designed around the ideal product flow for the core products of Stentor and provides ample space for various other products. The facility includes many features to enhance the working conditions for employees such as over 1.000 square meters of windows in the production hall, allowing an abundance of natural daylight in all working spots. Capacitive floor heating in the complete production hall assures an even, stable temperature with extremely low energy costs. The system has very little air movement compared to traditional air or radiation heaters which assures an optimum working environment for dedicated Plymovent® Diluters. These units continuously recycle and clean the air from particles created during welding and grinding activities. More cranes and lifting devices minimize manual lifting and electrical driven lorries are used for internal transport so no combustion engines are needed inside the facility. With a separated, climatologically controlled machining area, the new CNC boring machine is capable of delivery high precision machining results in a controlled and validated environment. Two plasma and oxy-fuel cutting systems provide an abundant capacity in Steel and Stainless Steel cutting. Plates sizes up to 15 x 3,5 meters and thicknesses up to 80 mm with plasma and 320 mm with Oxy-fuel. The bevel cutting option assures a high quality and efficient preparation for the further processes. With a CNC-controlled cylindrical and conical rolling capacity of processing material up to 2.500 mm width and a thickness up to 50 mm, accuracy, repeatability and efficiency are guaranteed. The NC-controlled machine processes extrusions and profiles with section modulus up to 600 cm3 with repeated accuracy and efficiency. With a range of presses up to 2000 tons force, Stentor is capable of handling the most demanding forming requirements in the market. Inside nozzle shells up to 3.000 mm diameter and 30 mm wall thickness can be pressed from a single piece of material providing the most accurate inlet curves in the market. Combined with the in-house tool and model shop Stentor provides a complete array of services aimed at high quality, heavy duty parts. 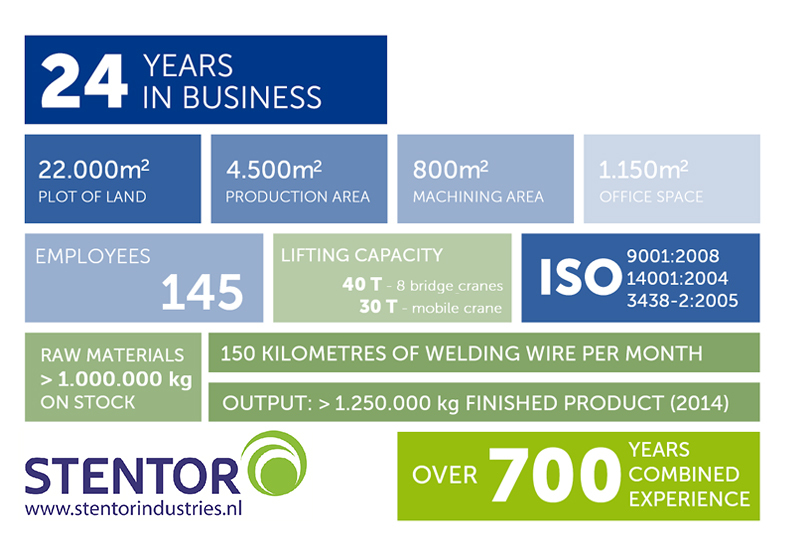 In 2014 Stentor took delivery of a specially designed and purposely build spinning machine. Although some similar machines are available in the market, Stentor decided to create an optimized version based on Stentor requirements and a careful analysis of all essential parameters and possible constraints. In close cooperation with a Dutch specialist design and construction firm the machine has been developed and was installed in late-autumn 2014. After an extensive testing period and creating many test products Stentor is offering spinning technology for all nozzles (with focus on > 3.000 mm) to its customers. Submerged Arc Welding with a capacity up to 1.200A is combined with NC controlled manipulators capable of handling products up to 30 tons and an external diameter of 7.800 mm. Our machining capabilities range from basic activities such as Milling and Lathe operations to the most demanding CNC controlled operations in horizontal boring. 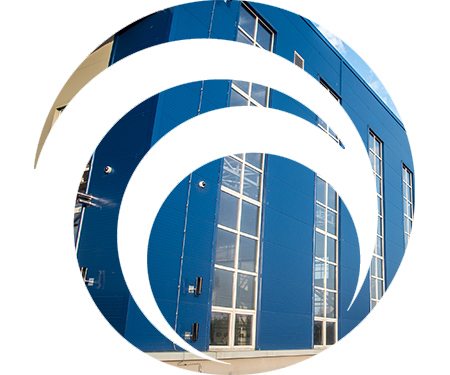 In-house components up to 7 tons can be handled within the approximate 3 x 2 x 2 meter space envelope, larger structures can be machined at our, nearby, designated partners. In the in-house shot blast cabin, structures up to 7 x 7 x 4 meters can be handled. Stentor uses chilled cast steel grit for optimum results with full recycling. Combined with the paint shop the conservation loop is closed and quality guaranteed. The Stentor Paint shop is capable of handling most paint systems, varying for a simple shop primer to complex, multi-layer conservations. With in-house mixing and testing Stentor warrants the quality and maintains this on the level dictated by the original manufacturer.